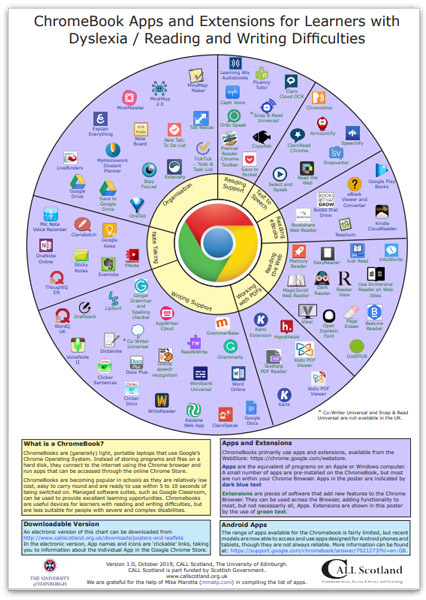 Following on from the evident world-wide success of our iPad and Android App Wheels for learners with dyslexia, we have been encouraged to produce a similar poster for ChromeBooks, which have become very popular in the USA and are starting to make inroads into schools in the UK. In view of the distinction between Apps and Extensions in the Chrome operating system, we quickly realised that a 'wheel' would not work, so we opted for a 'wall', with Apps represented by yellow bricks and Extensions by red. As with the app wheels, we have attempted to categorise the apps, but this has not always been easy. In the case of some of the multi-function extensions and apps, e.g. Read&Write, we tried to place them into the most appropriate category, but we recognise that they could easily be placed in more than one category. The Apps and Extensions included in the wall are not intended to form a definitive list of the 'best' options, but to give people an idea of what might be worth considering. There are many other apps that could have been included and we will review the contents of the wall at regular intervals to decide whether to add new Apps and Extensions, or to remove others. We are very grateful for the help of Mike Marotta in producing this poster. Mike has extensive experience of using ChromeBooks with learners in the USA and made many useful suggestions with regard to content. We will soon have further information about using ChromeBooks in education on our web site, but, in the meantime, we have prepared a Quick Guide to Chromebook Accessibility Features.